Bangkok, Thailand the 4th november 2011. A man drives a boat close to Planes in flooded Don Mueang domestic Airport. Bangkok, Thailand the 3th november 2011. 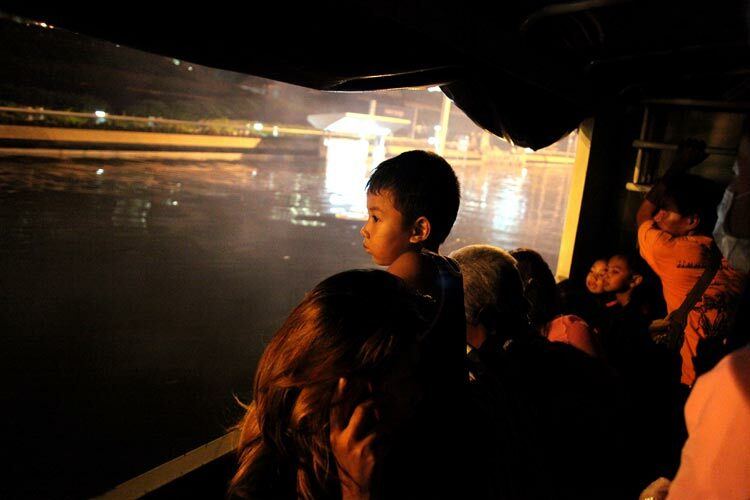 A young Refugee looks flooded area at night in a truck going from refugees camp to another because of lack of space near by Don Mueang domestic Airport flooded area. Bangkok, Thailand the 5th november 2011. 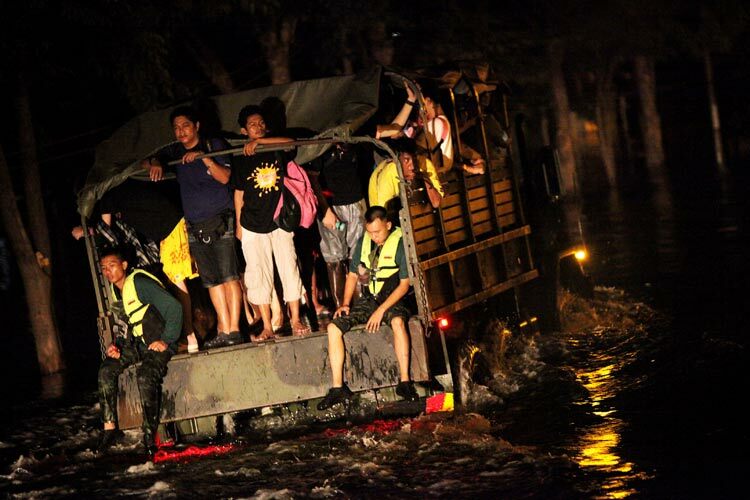 An army truck carrie people blocked by floods in a new flooded district in Bangkok center. Bangkok, Thailand the 1st november 2011. 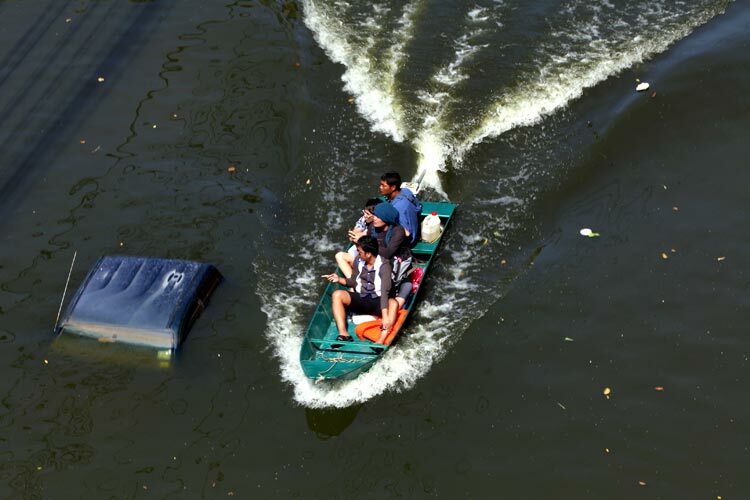 A man on a small boat helps resident to get around in bangkok flooded districts. Bangkok, Thailand the 4th november 2011. 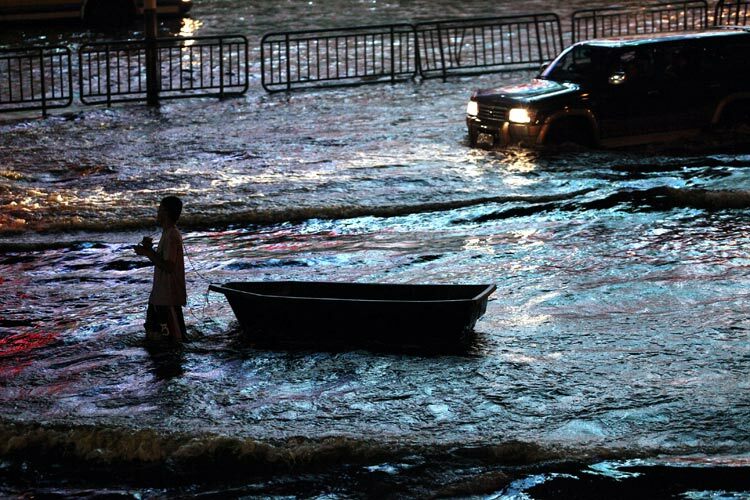 A boat transports people in flooded Don Muang domestic airport while new areas of Bangkok are flooded after a sluice gate was opened to a metre-wide. Bangkok, Thailand the 1st november 2011. 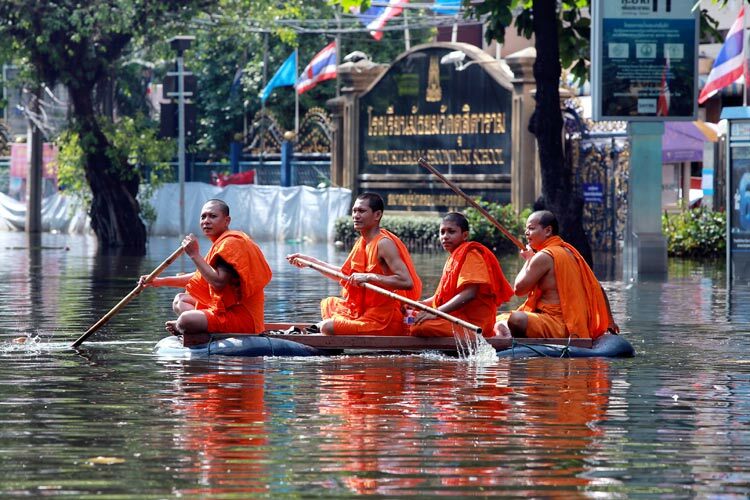 Monks close to their buddhism temple on a handmade boat in a flooded bangkok center district. Bangkok, Thailand the 1st november 2011. A young boy plays with ball in the water in front of a little shop that continues to sell food despite the floods. Bangkok, Thailand the 1st november 2011. 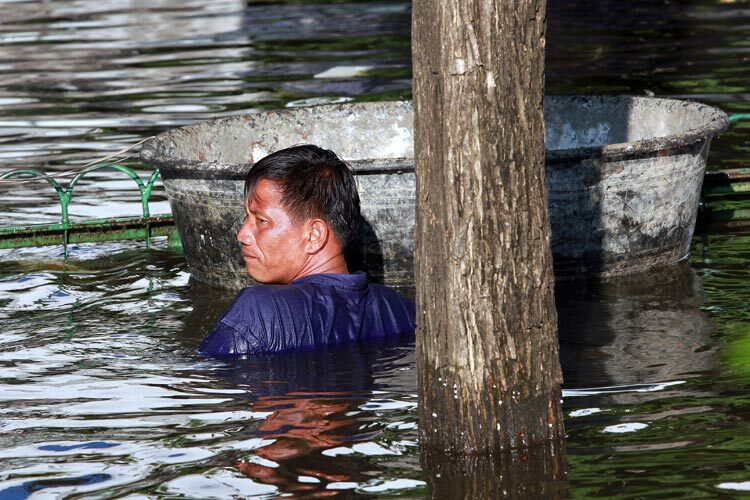 A man uses a bucket to transport people in Bangkok flooded district. Bangkok, Thailand the 5th november 2011. 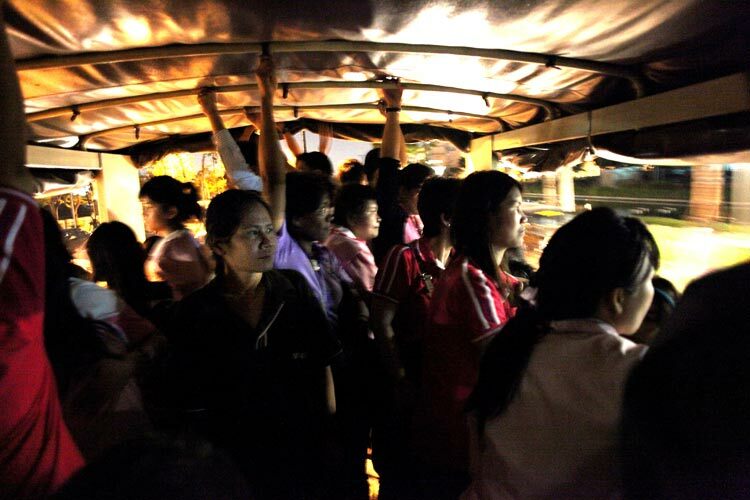 A bus carries people in a new Bangkok flooded district after a sluice gate was opened to a metre-wide. Water continues to infiltrate the city while the authorities are struggling to control floods. Bangkok, Thailand the 2th november 2011. 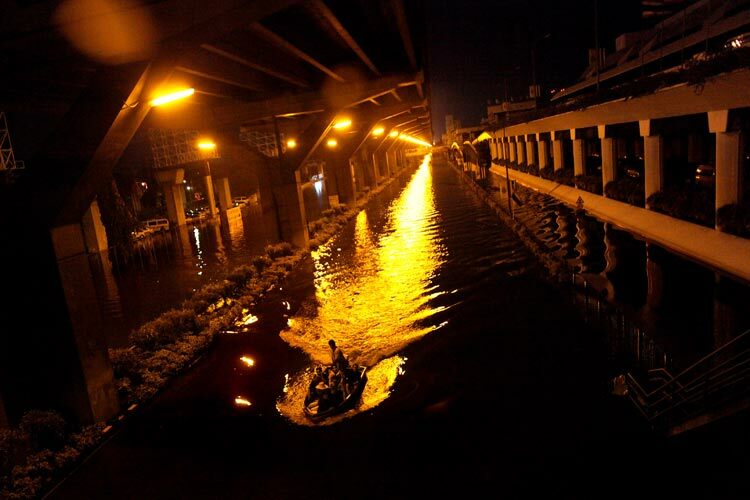 Floods in Bangkok, many parts of Bangkok were evacuated due to flooding. Bangkok, Thailand the 6th november 2011. 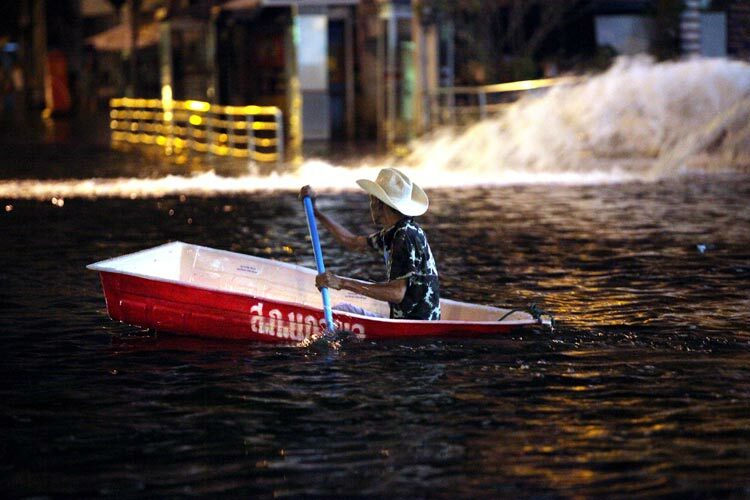 A man with a hat on a small boat must avoid water pumps rejected in a Bangkok flooded area. Bangkok, Thailand the 5th november 2011. 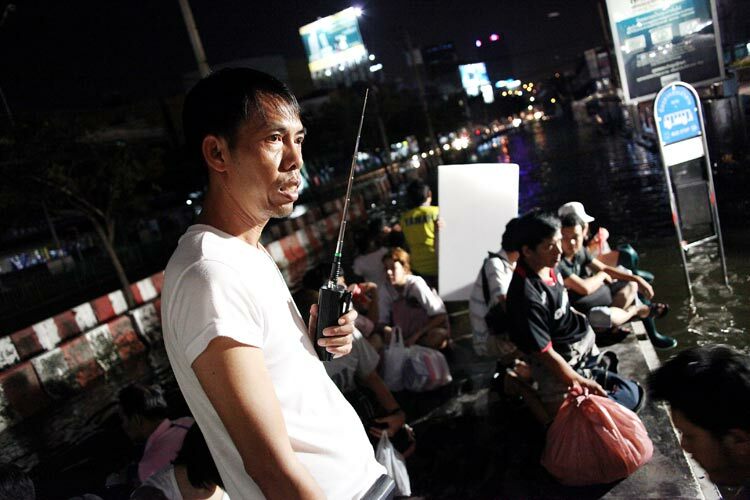 A soldier with a walkie talkie in an army truck carrying people blocked by floods in a new Bangkok flooded district after a sluice gate was opened to a metre-wide.Water continues to infiltrate the city while the authorities are struggling to control floods. Bangkok, Thailand the 1st november 2011. 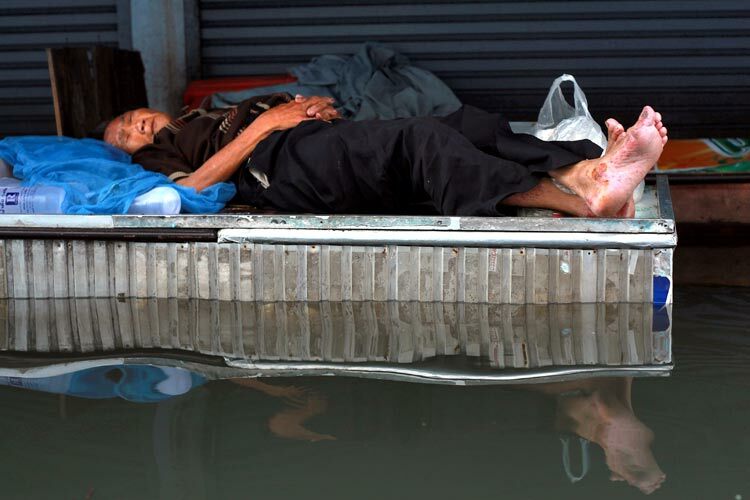 An old person sleeps on a fridge in a flooded street in Bangkok center. 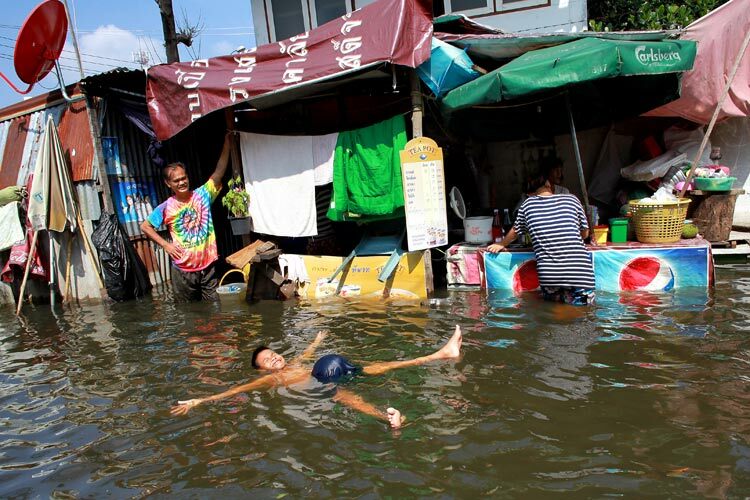 Despite many parts of Bangkok were evacuated due to flooding a lot of people continued to live in their neighborhood. Bangkok, Thailand the 1st november 2011. A woman washes dishes while her children play on the floor in their flooded home. 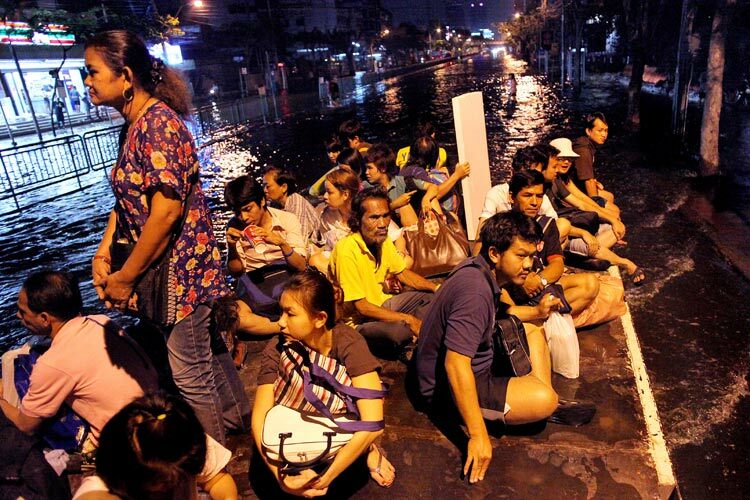 Despite many parts of Bangkok were evacuated due to flooding a lot of people continued to live in their neighborhood. Bangkok, Thailand the 5th november 2011. 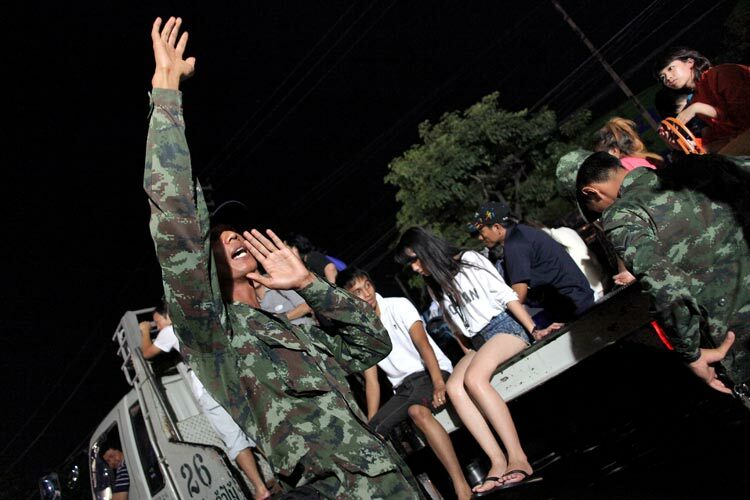 An army truck carries people blocked by floods in a new Bangkok flooded district after a sluice gate was opened to a metre-wide.Water continues to infiltrate the city while the authorities are struggling to control floods. Bangkok, Thailand the 4th november 2011. 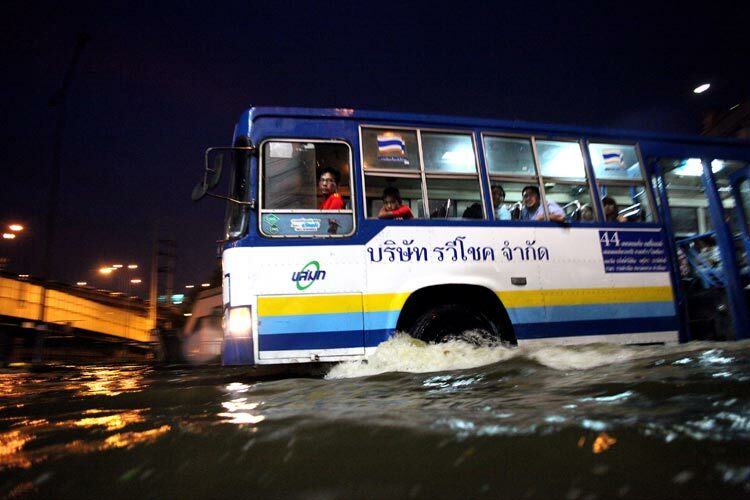 Shuttle Truck carries people in flooded Don Mueang domestic Airport while new areas of Bangkok have been flooded after a sluice gate was opened to a metre-wide. Bangkok, Thailand the 4th november 2011. 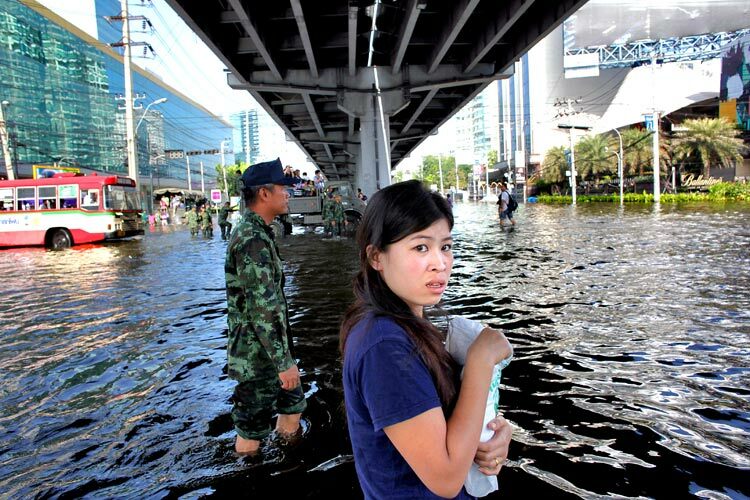 A man and a woman walk in Don Mueang Airport flooded area while new areas of Bangkok have been flooded after a sluice gate was opened to a metre-wide. Bangkok, Thailand the 8th november 2011. 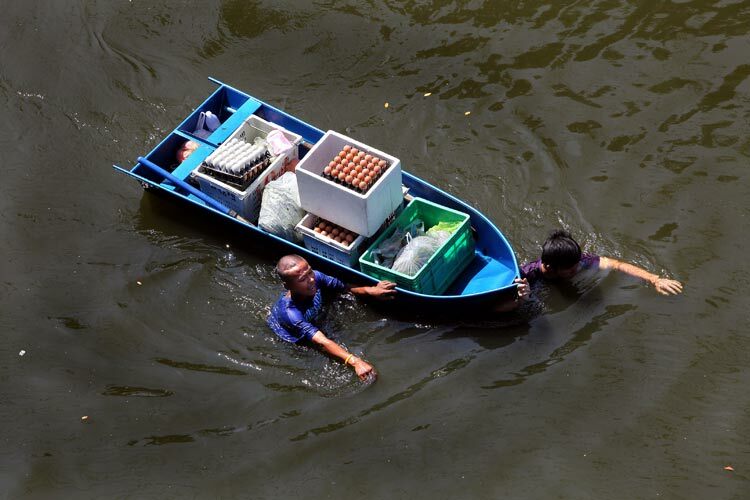 People push boat carrying eggs food and drink close to Don Mueang domestic Airport flooded area. 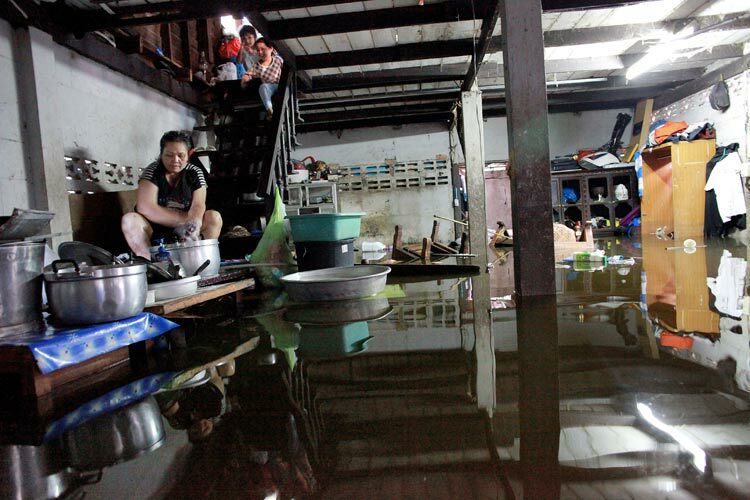 After a sluice gate was opened to a metre-wide, new parts of Bangkok are affected by floods and water continues to infiltrate the city while the authorities are struggling to control floods. Bangkok, Thailand the 1st november 2011. 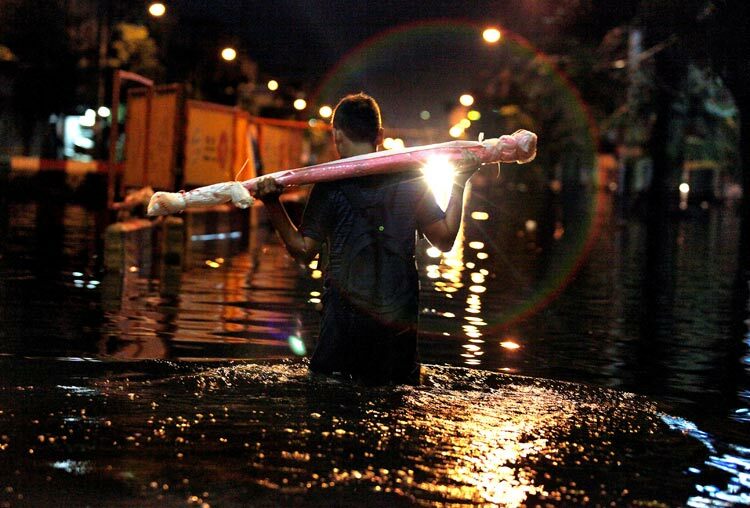 A volunteer with his scale on a truck helps people to cross the flooded districts. Bangkok, Thailand the 3th november 2011. Refugees in a truck go from refugees camp to another because of lack of space near by flooded Don Mueang domestic Airport. Bangkok, Thailand the 6th november 2011. 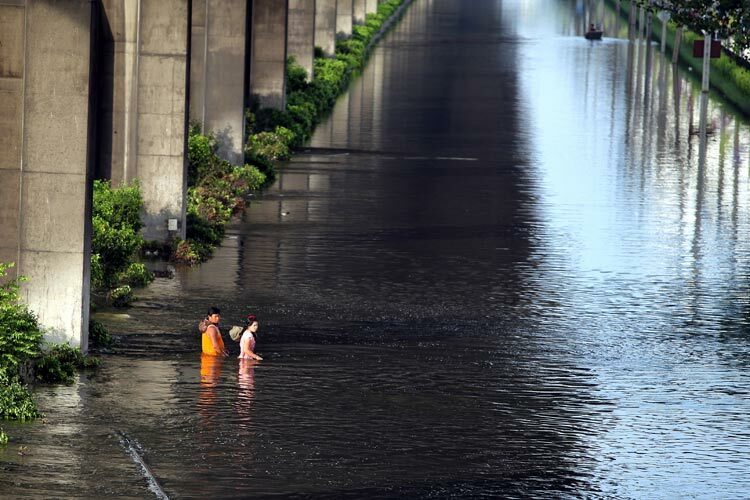 A man walks in water in a Bangkok flooded area. Bangkok, Thailand the 2th november 2011. People wait for trucks to cross water in flooded area. Bangkok, Thailand the 2th november 2011. 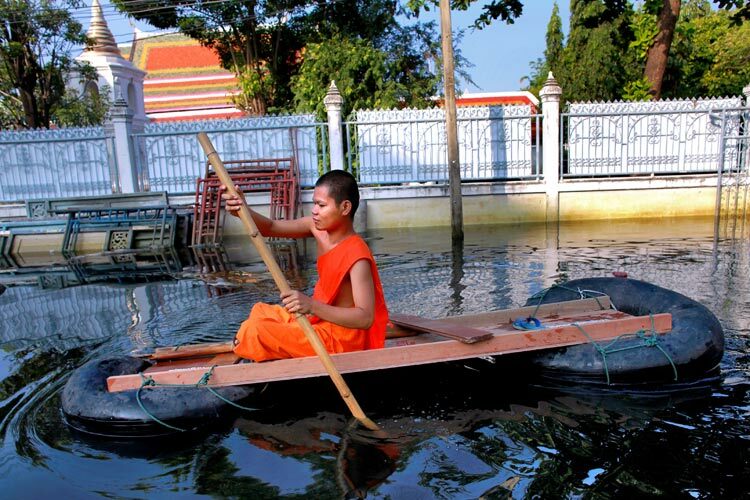 A monks on a handmade boat in a flooded buddhism temple. Bangkok, Thailand the 2th november 2011. 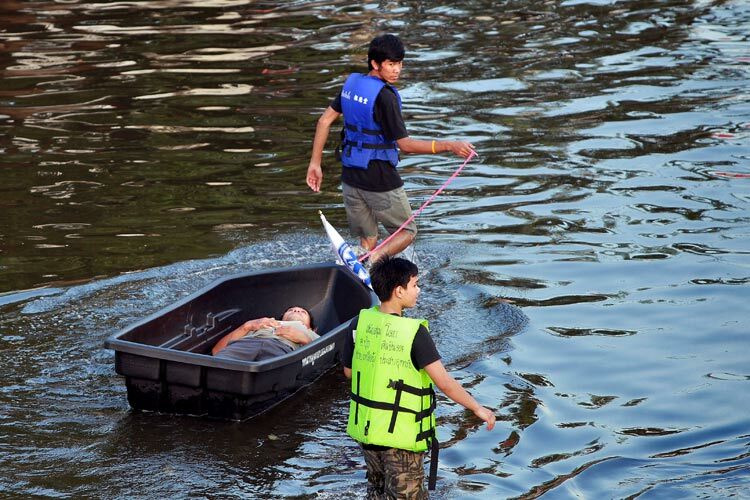 A sick man lying on a boat is transported in Bangkok flooded area. Bangkok, Thailand the 3th november 2011. 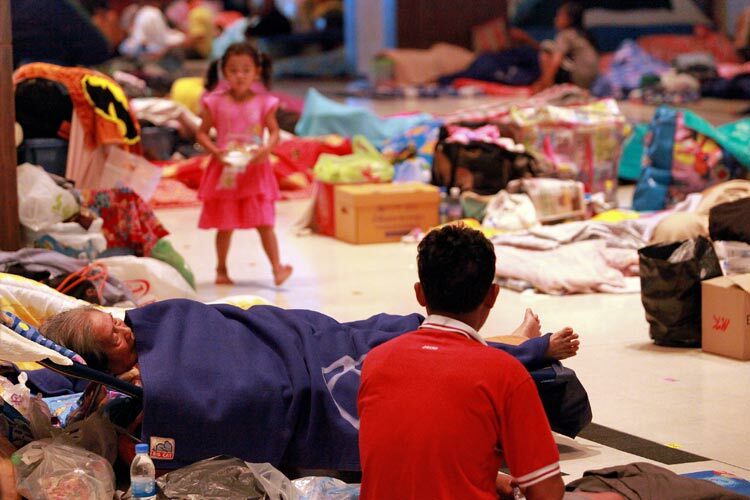 An old man sleeps On a dormitorie in a 2,500 people refugee camp close to Don Mueang domestic flooded Airport. Bangkok, Thailand the 3th november 2011. 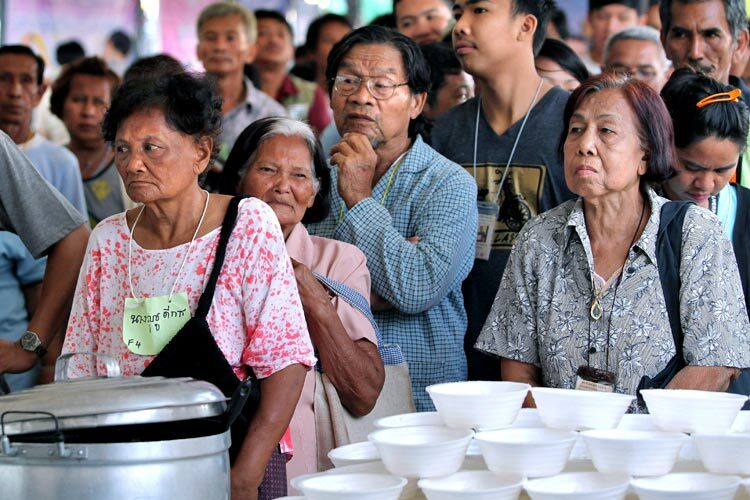 Refugees line up to eat in a 2,500 people refugee camp close to Don Mueang domestic flooded Airport. Bangkok, Thailand the 3th november 2011. A woman with her baby talks to a doctor in a medical center based in a 2,500 people refugee camp close to Don Mueang domestic flooded Airport. Bangkok, Tailand the 8th november 2011. 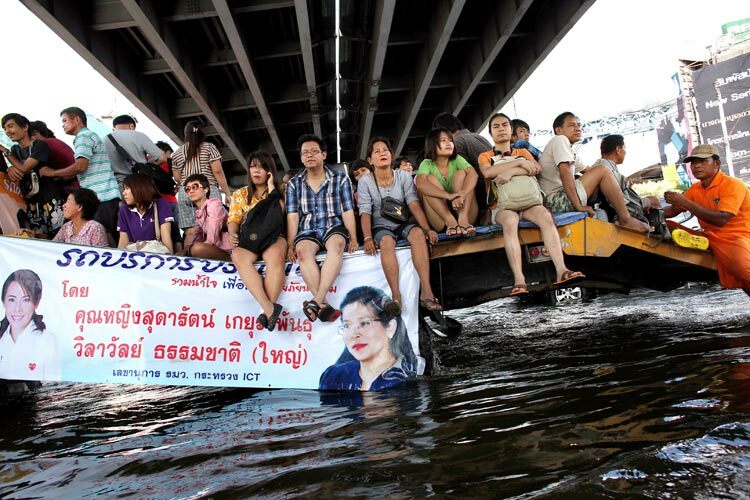 A truck carries people blocked by floods in a new Bangkok flooded district. Water continues to infiltrate the city while the authorities are struggling to control floods. Bangkok, Thailand the 4th november 2011. 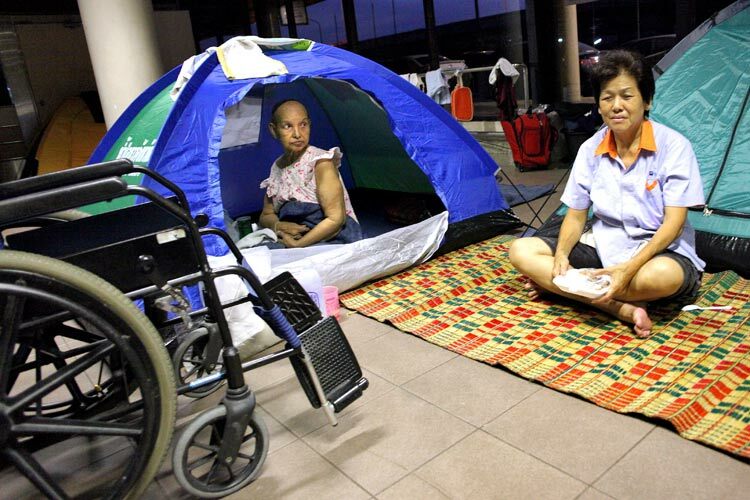 A elderly sick person in her tent with friend in flooded Don Mueang domestic airport transformed into a 250 people flood camp. Bangkok, Thailand the 8th november 2011. People on a small boat look at a flooded car close to Don Mueang flooded domestic Airport. Bangkok, Thailand the 5th november 2011. 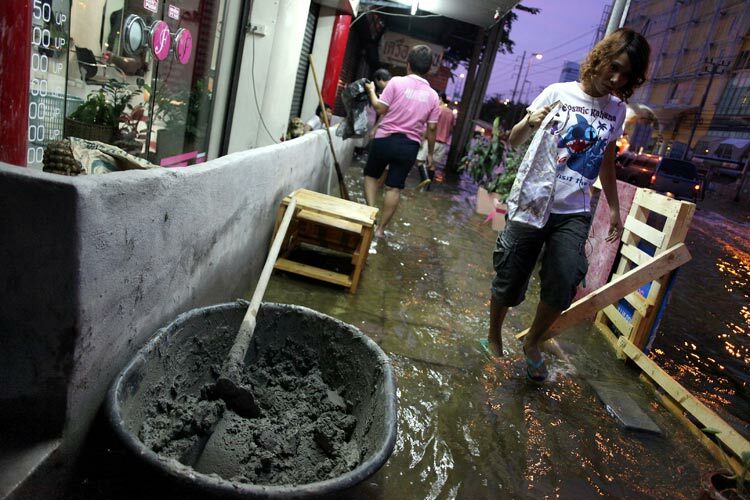 A woman walks along a store protected by a small wall in a new flooded Bangkok district. Water continues to infiltrate the city while the authorities are struggling to control floods. Bangkok, Thailand the 5th november 2011. A man holds his small boat on a new flooded road. Water continues to infiltrate the city while the authorities are struggling to control floods. Bangkok, Thailand the 6th november 2011. 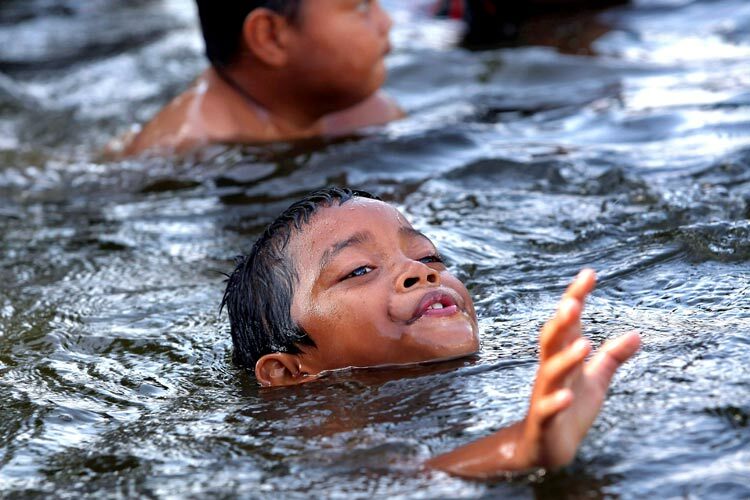 Children swim in a flooded Bangkok area. Bangkok, Thailand the 6th november 2011. 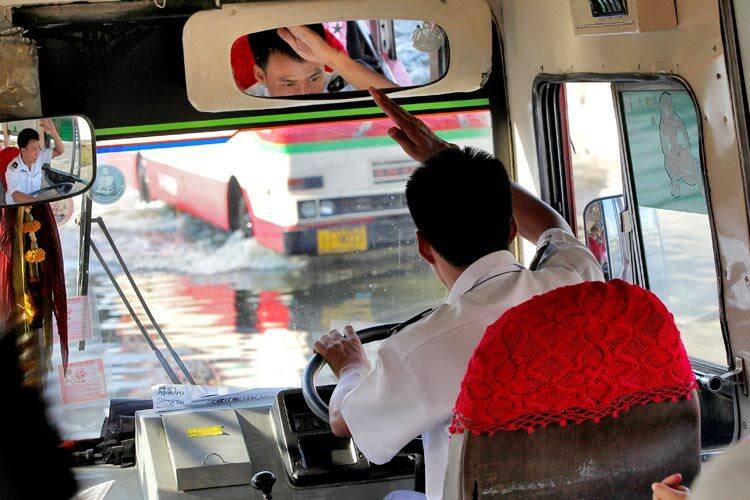 A bus driver crosses a flooded Bangkok area and tries to attract attention of another bus. Bangkok, Thailand the 6th november 2011. 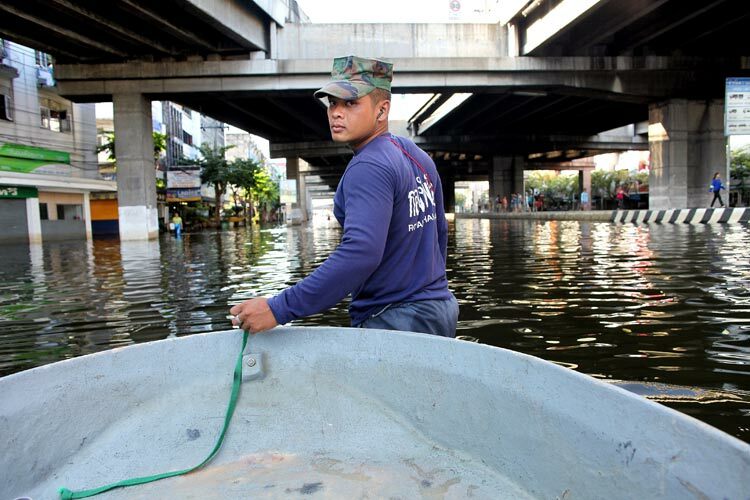 A royal Thai Navy officer looks for people who needs boat in a flooded Bangkok area. 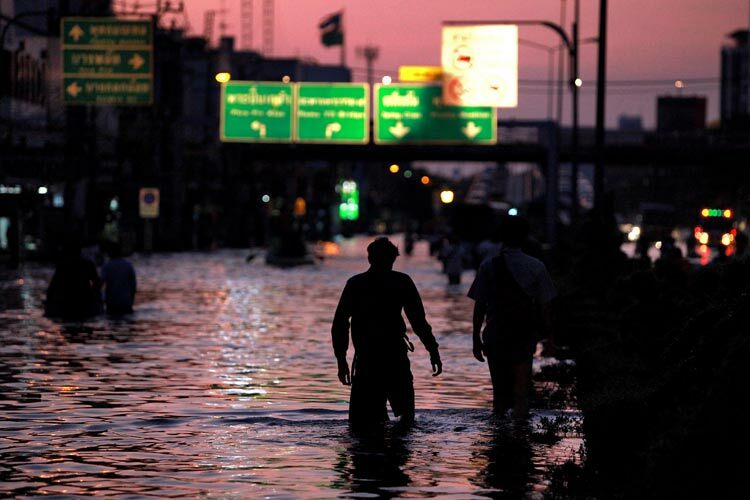 New parts of Bangkok are affected by floods and water continues to infiltrate the city while the authorities are struggling to control floods. Bangkok, Thailand the 8th november 2011. 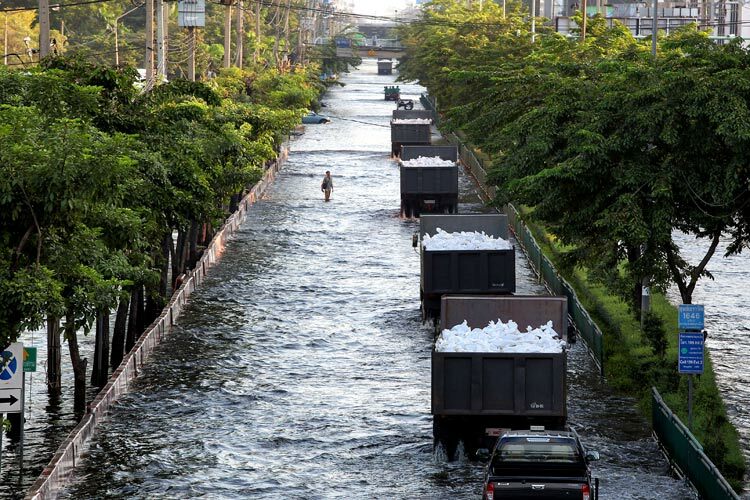 Trucks full of sand bags for making wall against floods run in a new flooded Bangkok area. Water continues to infiltrate the city while the authorities are struggling to control floods. Bangkok, Thailand the 8th november 2011. 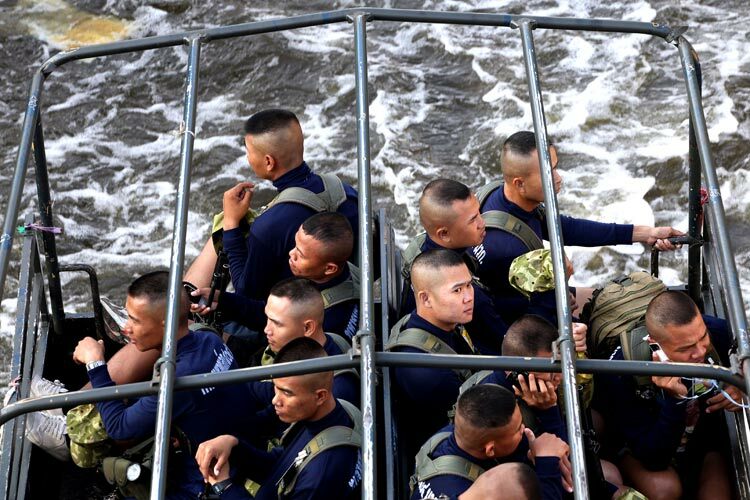 Officers with weapons inside an army truck passes through a new flooded Bangkok area. Water continues to infiltrate the city while the authorities are struggling to control floods. Bangkok, Thailand the 8th november 2011. 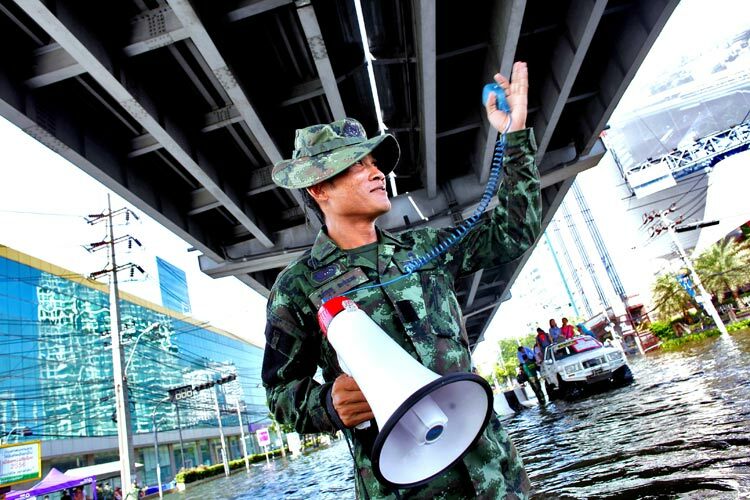 An Army officer controls and organizes traffic with a megaphone in a flooded Bangkok area. Water continues to infiltrate the city while the authorities are struggling to control floods. Bangkok, Thailand the 8th november 2011. 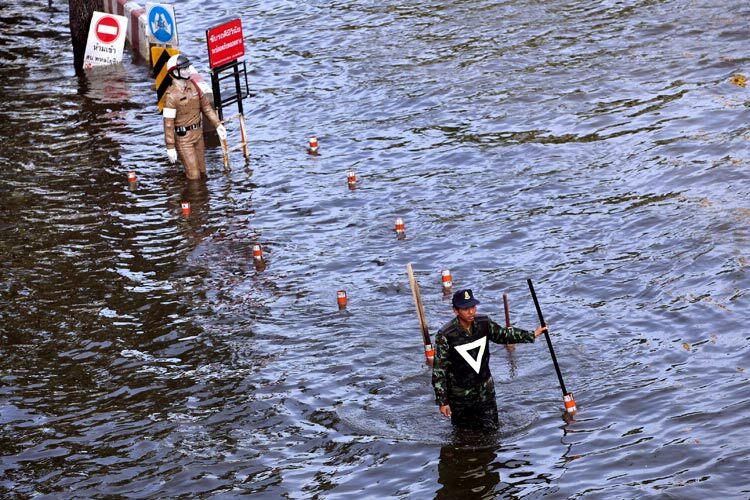 An Army officer controls and organizes traffic in front of a plastic policeman model in a flooded Bangkok area. Bangkok, Thailand the 8th november 2011. 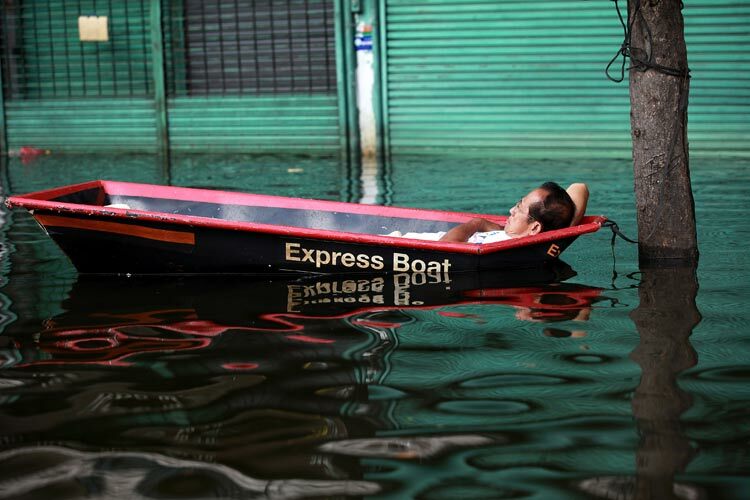 A woman waits the bus in a flooded Bangkok area. Water continues to infiltrate the city while the authorities are struggling to control floods.